"A scenic view of impressive grandeur, looking easterly from the Lorne"; from "A Souvenier of Visit to Lorne Gold Mine, September 23rd, 1928". "Canal carrying water from Cadwallader Creek. Part of the water power development of the Lorne. "; from "A Souvenier of Visit to Lorne Gold Mine, September 23rd, 1928". 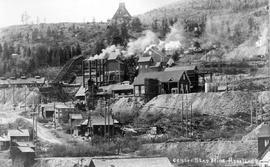 "Centre Star Mine, Rossland, BC." "Chinamen washing for gold near North Bend"; Fraser River. "Gold mining in Atlin, BC; blasting." "Mining gold with a grizzly"; Department of Mines albums. 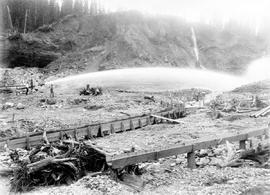 "Ore train, Nickle Plate Mine, Hedley, BC". "View showing proximity of Granby's ore bins and loading track to the school". A First Nations family with sluice boxes and rockers; looking for gold on the Fraser River; miscellaneous B album. A gold mine; location unknown. A miner in the Le Roi Mine, Rossland. A rocker used for washing gold. Adams and Day at the middle dump of the Ingenika Mine. An unidentified mine near Greenwood. At the Victoria Mine, Camp McKinney.